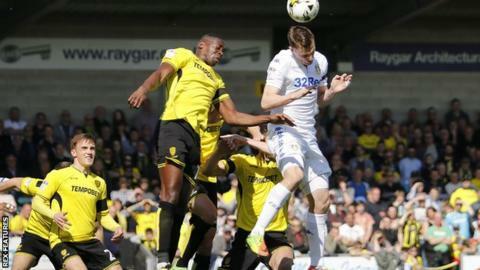 Burton Albion all but secured Championship football for a second season with a home win over Leeds that dented the visitors' play-off hopes. Marvin Sordell curled in to give the hosts the lead with 15 minutes to play. Two minutes later, Michael Kightly slotted into the far corner but Leeds quickly hit back through Kyle Bartley's close-range effort at the far post. Leeds could not find a late equaliser and dropped three points below the top six with just two matches remaining. Victory was Burton's second in a row, after winning at relegation rivals Birmingham on Monday, and lifted them six points above the drop zone with just two games to play. The Brewers - competing in the second tier for the first time in their history this season - look set for another year in the Championship and could well be joined by a seventh-placed Leeds side whose top-six prospects were hampered by a fourth loss in six games. Garry Monk's team had hope of a late comeback when centre-back Bartley poked in from top scorer Chris Wood's guided header across the face of goal. But Leeds' Kemar Roofe had an effort cleared off the line with six minutes to play and that was as close as the visitors came to earning a point. Burton Albion manager Nigel Clough: "With the other results around today it was imperative that we got something out of this one, either a draw or a win. To win the game with all the nervous tension around the place, especially in the last 10 minutes, speaks volumes for the character of the players. "I am very pleased with our two goals. It's a lovely strike from Marvin Sordell. Once he gets turned he hits it with such power and accuracy it's difficult for the goalkeeper. Then you get the second so quickly and it would have knocked the stuffing out of most teams but Leeds came straight back at us. "To be one point away, as it stands, we won't be celebrating or anything until we get that point, hopefully at Barnsley. The dressing room is euphoric right now but tinged with an element of disappointment that it is not done yet. We thought we might do it today but it hasn't worked out that way so we keep battling on." Leeds United head coach Garry Monk: "I think it is an extremely unfair result on my players to be honest. Second half there was only one team on the front foot. We started it extremely well and we were pushing and looking the most dangerous team. "The goal came right against the run of play and it was a mistake from ourselves and they got the goal from it. From there we lost our composure a bit. I think it was the shock of them scoring when we were on the front foot. "They got a second in that short period and we had to fight right to the end. We perhaps didn't have the right quality in certain situations today but we didn't deserve to lose that game." Match ends, Burton Albion 2, Leeds United 1. Second Half ends, Burton Albion 2, Leeds United 1. Foul by Ronaldo Vieira (Leeds United). Jackson Irvine (Burton Albion) wins a free kick in the defensive half. Hand ball by Michael Kightly (Burton Albion). Michael Kightly (Burton Albion) is shown the yellow card. Attempt saved. Luke Varney (Burton Albion) right footed shot from a difficult angle on the right is saved in the bottom left corner. Attempt blocked. Luke Varney (Burton Albion) right footed shot from the centre of the box is blocked. Assisted by Michael Kightly. Foul by Kyle Bartley (Leeds United). John Mousinho (Burton Albion) wins a free kick in the defensive half. Substitution, Burton Albion. Luke Varney replaces Marvin Sordell. Attempt blocked. Kemar Roofe (Leeds United) right footed shot from very close range is blocked. Assisted by Kyle Bartley. Attempt missed. Kyle Bartley (Leeds United) header from the centre of the box misses to the right. Assisted by Luke Ayling with a cross. Goal! Burton Albion 2, Leeds United 1. Kyle Bartley (Leeds United) right footed shot from very close range to the high centre of the goal. Assisted by Chris Wood with a headed pass following a set piece situation. Substitution, Burton Albion. Damien McCrory replaces John Brayford. Foul by Michael Kightly (Burton Albion). Goal! Burton Albion 2, Leeds United 0. Michael Kightly (Burton Albion) left footed shot from the centre of the box to the bottom right corner. Assisted by Marvin Sordell. Goal! Burton Albion 1, Leeds United 0. Marvin Sordell (Burton Albion) right footed shot from outside the box to the bottom right corner. Assisted by Michael Kightly. Attempt missed. Pontus Jansson (Leeds United) header from the centre of the box misses to the right. Assisted by Pablo Hernández with a cross following a corner. Corner, Leeds United. Conceded by Kyle McFadzean. Luke Ayling (Leeds United) wins a free kick in the defensive half. Foul by Marvin Sordell (Burton Albion). Offside, Leeds United. Pablo Hernández tries a through ball, but Chris Wood is caught offside. Substitution, Leeds United. Alfonso replaces Kalvin Phillips. Substitution, Burton Albion. Michael Kightly replaces Lloyd Dyer. Attempt missed. Pablo Hernández (Leeds United) header from the centre of the box misses to the right. Assisted by Charlie Taylor with a cross. Substitution, Leeds United. Hadi Sacko replaces Souleymane Doukara. Foul by John Brayford (Burton Albion). Attempt blocked. Lloyd Dyer (Burton Albion) left footed shot from the left side of the box is blocked. Assisted by John Brayford with a cross. Second Half begins Burton Albion 0, Leeds United 0. First Half ends, Burton Albion 0, Leeds United 0. Attempt missed. Kalvin Phillips (Leeds United) right footed shot from outside the box is too high following a corner.